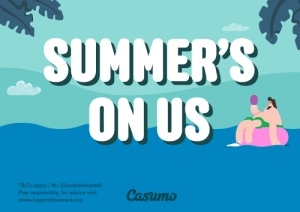 Casumo’s excellent Summer Prizewave promotion has entertained us with daily Reel Races with big prizes for the last few weeks, but unfortunately it’s about to come to an end. But there’s no reason to feel sad - to make the last batch of races even more exciting, the casino is boosting the daily prizes to £5,000 cash this week! There’s a good mix of both new releases and classic favourites in the schedule, so pick out your favourites and go for the daily £5,000 first place prize. The Summer Prizewave ends with a bang on the popular Play’n GO slot Book of Dead, where the grand prize is £10,000 in real cash - it’s a race you definitely don’t want to miss! There’s a bunch of new games coming up at Casumo, so it’s gonna be a busy week for those of us who like to try out all the latest slots. Some of the highlights include Eastern Emeralds from Quickspin and Book of Ra Magic from Greentube, and you can head over to the games lobby to check out all of the new releases as they become available for everyone. Casumo is one of the best UK casinos on the internet, and we constantly hear about new winners who struck really big in a game. The latest story is about the UK player Dennis who placed a bet of £2 on Divine Fortune, resulting in an enormous jackpot win of £65,826. Join Casumo now, and maybe you could be featured in their next winner story!